Specialists in Shelving, light racking, pallet racking,mobile shelving and mezzanine floors. Welcome to First Storage Concepts , who are a “peoples” company with dedicated teams to provide quality products and services. Because we at First, have over 30 years combined experience in Office and Storage management, we can help plan the most effective office and storage system for you and your organisation. 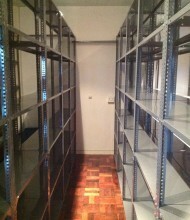 A First Storage specialist will visit you or your company and assess your needs and objectives. We will then advise and devise the optimum system for you. This service will save you time and will guarantee you the best possible system. In conjuction with our specialised planning and design service, we can install any of the quality office and storage products in our brochure. Just ask for a quote and we’ll be glad to help. All FIRST products are available in component form for self assembly or can be supplied as part of a comprehensive design and installation service from our sales office.